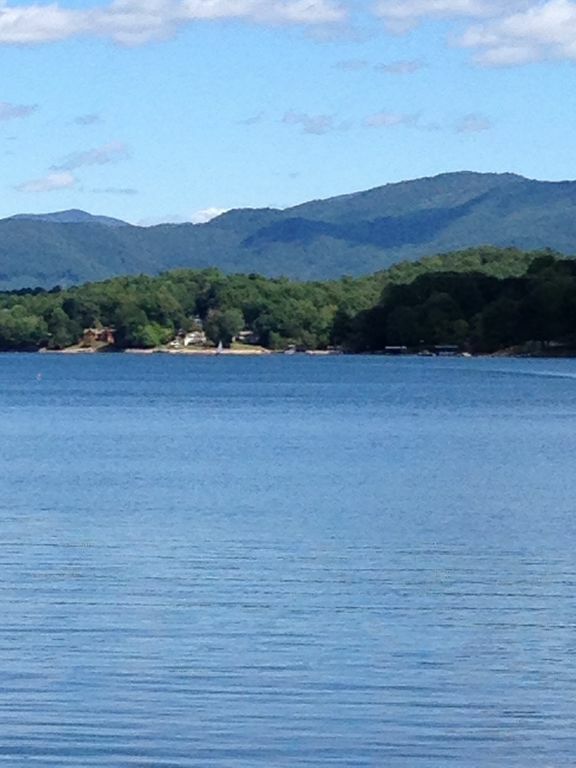 This beautiful 2 Bdr/2 Ba condo is located just a short walk away from the Ridges Resort marina on Lake Chatuge. The condo has a spectacular mountain view along with limited lake view. This end unit is on the 2nd floor and has elevator access in the parking lot. The Master Bedroom has a King bed along with Master Bath that includes a glass enclosed shower and separate jetted tub. Second bedroom has a Queen bed and has access to a full bath off bedroom. Each bedroom has a flat screen TV. Kitchen is well equipped with granite countertops, stainless appliances as well as a Keurig coffee maker. There is a large dining area where you can enjoy a home cooked meal with family or friends. Living room has 43" TV with cable along with gas fireplace and leather reclining sofa and loveseat. Here you can enjoy an evening relaxing after your day on the lake or exploring the mountains and its' surroundings. There's a balcony where you can take in the sights of Ramey mountain which is directly in front of you. It's the perfect place to enjoy your morning cup of coffee or evening cocktail. There is a full sized laundry facility located inside unit as well as a community pool and clubhouse. The Georgia Mountain Fairgrounds along with public beach access to lake is located approximately 4 miles away. Harrahs River Valley casino is approximately 25 minutes away. Other local attractions include golf courses, wineries, horseback riding and waterfalls. This condo is ideally located approximately 140 miles from Atlanta and just minutes from downtown Hiawassee and Young Harris. Living room has couch, love seat and chair. 43" TV with satellite. Gas fireplace. Paper goods such as paper towels and trash bags are provided. Dishes and utensils provided. You'll find almost all necessary items you'll need to cook that special meal. HD TVs in bedrooms and living room. All have satellite. DVD player in living room. Everything was great!! Clean and very nice inside. Super location! Thanks so much for taking the time to review your stay. Happy to hear you had a great stay and enjoyed the area. Hope you’ll consider staying with us again! Great location and lovely condo. Everything was perfect and beautifully decorated at the condo. It was so clean. Loved the balcony and looking at Lake Chatuge. The Oaks Restaurant, close to condo was a great place to eat. Karen answered all our questions quickly. I will be back. Beautiful spot, lovely furnishings and a great walking area!!! Can’t wait to go back!!! So glad you enjoyed your stay! We agree it’s a great location with plenty to do and see. Hope you’ll stay with us on your return visit and thank you for taking the time to let us know your thoughts on your stay. Special touches that keep you coming back. Karen has done a lovely job of decorating and supplying neccessities. Items such as garbage bags, paper towels, napkins, laundry detergent, toilet paper, dish soap, etc. Mustard, mayo, ketchup, cooking oil, sugar, flour, etc were also items that were supplied, or left by other renters for you to use. So helpful, as you don't have to spend a fortune on all the staples just for a few days. Special touches, such as, a bottle of wine, chocolate, water and some beers in the fridge. She is certainly generous and knows what it takes for a return visit. Condo was very comfortable and very clean upon arrival---a very important factor for me and one that is overlooked by many a VRBO owner. Beds were comfortable. Not too hard and not too soft. All the cooking utensils, appliances, pots/pans in the kitchen you would ever need. A perfect set up for 2 people or 2 couples in a convenient location to Hiawassee, Young Harris, Blairsville, Murphy or Hayesville. Karen is very accessible and responds quickly to emails, which is convenient while renting, or initially inquiring. Thank you for a very easy, uncomplicated stay in a lovely VRBO. Thank you for letting us know how much you enjoyed your stay. We’re happy you appreciated the well stocked kitchen and necessities! I agree, it’s nice not to have to go buy those things for a short stay. We make sure our place is stocked before each rental. We love our condo and the location and hope you’ll consider a return visit the next time you plan a mountain getaway. Thanks again! We have stayed at over a dozen properties in the last couple of years. This condo was the absolute cleanest ever. Great location and very well equipped. We appreciate you taking the time to review your stay. We make it a priority to make sure our condo is clean and well stocked to ensure our guests have a great experience while being in our home away from home! Hope you’ll decide to book with us in the future. We have booked several house and condo rentals over the past few years and this was one of our best experiences. The condo was tastefully decorated and furnished and spotless clean. After our last rental in Florida I decided to bring our robot vacuum from home anytime we rent because I can't stand gritty floors. I never unpacked it from the car since this condo was so clean. The kitchen was well stocked with all the cooking utensils we needed. We were pleasantly surprised to find basic pantry items supplied as well including flour, sugar, salt, pepper and oil. The owners also supplied kcups for coffee and tea and even though we didn't use them it was a very nice touch. We had a very pleasant stay in this condo and these owners have thought of everything we could want to ensure we had a great time. We love to hear when our guests have a pleasant stay. We think it's important to have our home supplied with things we would want to find if we were staying in someone else's home. We believe it helps in making the stay away a more pleasant experience. We love the location of our condo and spend as much time as we can there. I truly appreciate you taking the time to let us know about your experience. Hope you'll consider another stay the next time you're ready for a mountain getaway. Thanks again! Rates are subject to change until reservation is confirmed. Monies will be refunded if cancelled 30 days or more prior to arrival date. Absolutely no smoking or pets allowed in rental unit.